In 2004 my state had one of the closest races for Governor ever. On election night, it appeared that the Republican candidate, former state senator Dino Rossi, was the winner—but by only 261 votes. When all counties had finished counting ballots (but before the results were certified), former state Attorney General Christine Gregoire had pulled ahead of Rossi by a mere 42 votes. At one point during the recounts1 her lead was only 10 votes, but when things were officially certified, her lead had reached 129 votes. The Republican National Committee paid a lot of money to finance a legal challenge to the certified count, insisting that lots of illegal ballots had been counted. The case is famous for the result that after spending millions and sorting through all the voter rolls the Republicans did find exactly 4 illegally cast ballots: all four of them had been cast for Dino Rossi, because each of the illegal ballots had been cast by ex-convicts who had not had their right to vote restored2. Each of them had voted for Rossi because they are angry at Gregoire for (essentially) doing a very good job during her years in the state’s Justice Department. In other words, the Republicans spent a lot of money proving their guy’s loss was worse than it appeared, and ironically revealed to the public that the Democratic candidate was perceived as much tougher on crime than the Republican, at least in the eyes of some criminals. Throughout the next four years3 certain angry people in our state kept insisting that the election had been stolen by evil democratic minions in King County, mostly because they couldn’t understand that winning in the mostly populous county in the state by about 70% is going to beat winning in a bunch of the least populous counties by less than 60%. And boy, did I get an earful from some of my ultra-conservative relatives about all the “crooked liberals” in Seattle at the next several holiday gatherings. This is by far not the only time I’ve heard conservative people claim that when any election doesn’t go their way it’s because of ballot-stuffing in the cities. It’s hard for people to grasp the sheer scale of the differences in population density. Many counties in the U.S. have population densities of 1 or 2 people per square mile, while cities can reach densities of more than 50,000 per square mile (the New York City metropolitan area, for instance). It’s also hard to grasp the difference in ideology. 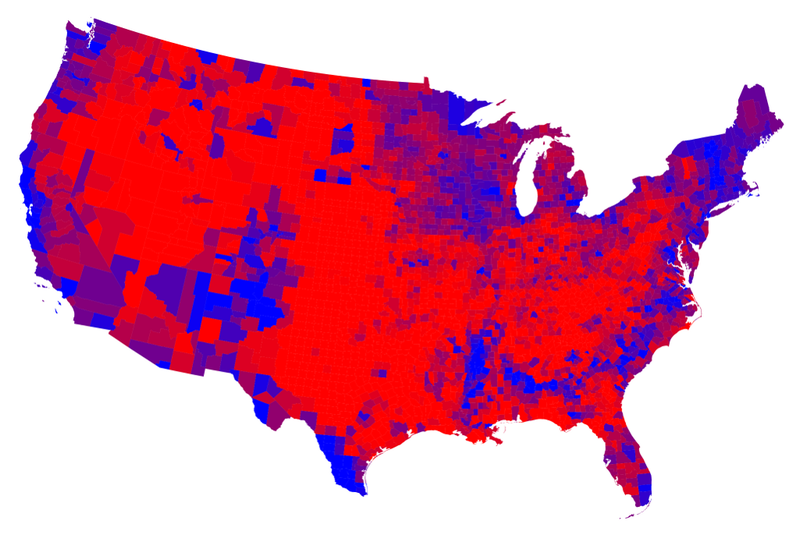 People who live in rural areas are far more likely to vote Republican and otherwise support conservative politics. People who live in cities are far more likely to lean the other way. It’s not just that they’re leaning, it’s also how far they lean. You’re much more likely to find a majority of moderate conservatives in the suburbs than in small towns and unincorporated communities, for instance. And you’re much more likely to find the sorts of arch-conservatives who embrace the alt-right label those small towns and unincorporated communities4. There are many reasons for this divide. One simple one is migration. People growing up in those communities who don’t feel as welcome are more likely to move to the city. People who feel out of place in their small towns who go to cities (usually to attend college or look for work) discover not that everyone in the city agrees with them, but they can find communities or social circles where their differences are accepted and affirmed, and decide not to go back. Those of us who are queer understand this quite well, though we aren’t the only ones. Another difference is a natural consequence of the density. Living a city, it is impossible not to come into contact on a daily basis with people who are culturally, ethnically, religiously, and/or politically different than you. You interact with them, seeing that that are just people like yourself, merely with different experiences and beliefs. You learn to empathize with those perspectives. For a lot of us, it makes us more open to the other points of view than we may have been before. This was all brought to mind recently when an acquaintance was freaking out a bit about this article: More Americans move to cities in past decade-Census. It wasn’t that he didn’t know that more of the population of the country lives in cities than in non-urban areas. What freaked him out was how many more do. He though it the city-country divide was something like 60-40. It’s not. It’s 80-20. Let me repeat that: 80% of the U.S. populations lives in cities, suburbs, and large- and medium-sized towns. Only 20% live outside of those urban areas. We also have a lot of misconceptions about how diverse communities are, racially and otherwise. This article talks a bit about that with some fun observations: ‘Normal America’ Is Not A Small Town Of White People. 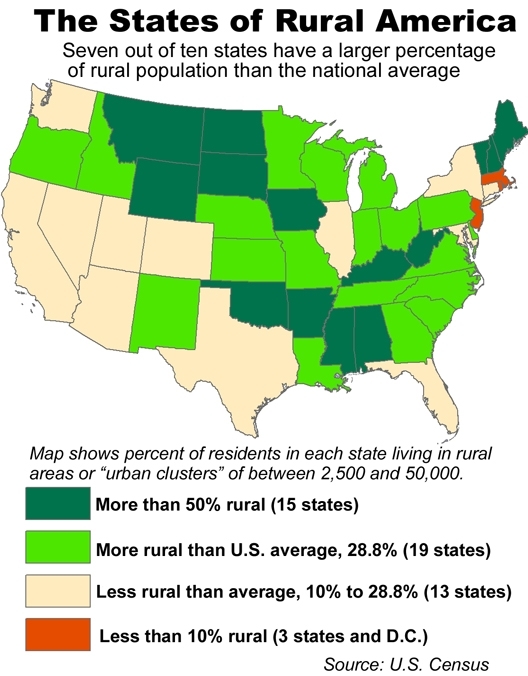 There is also the phenomenon of entire states that are far more rural than others (and the source of the second map I linked): 2012: Nearly three out of ten Americans live in a rural area or a small city. But in most states, the percentage of rural residents is far greater. Politicians of certain stripes are fond of talking about “real Americans” which is sometimes code for white, straight, and at least pseudo-Christian5. But it also often refers to people who live in small towns or on farms, with the implication that that makes up the majority of the population. Which gets us back to the reason many conservatives who don’t live in the largest cities think those cities are doing questionable things with ballot boxes. A lot of them don’t even understand that the majority of the population lives in cities. They think the urban dwellers are a minority somehow oppressing them. It’s also why most of them don’t realize that their small communities are being subsidized by the taxes paid by city dwellers, not the other way around. But that’s a whole other can of worms. 1. Which could have been avoided, because there were several thousand voters in my county who cast write-in votes for a former County Executive whom Gregoire had defeated in the primary, not aware that the state Constitution specifically forbids write-in votes to be certified for a candidate who lost in the Primary. 2. In Washington state, if you have been convicted of a felony you lose your right to vote. After you have served your time, you may petition to have your voting rights restored. But you have to actually file and make a court appearance to do it. 3. Four years later in the Rossi-Gregoire rematch she won by a more decisive 53% to 47%. 4. Not that you don’t find very liberal people in small towns, nor very conservative ones in the heart of the city. There are always outliers everywhere. 5. By which I mean people who give lip service to being Christians, and get foaming at the mouth angry if someone objects to a Ten Commandments monument in a courthouse, but otherwise don’t act as if they understand a single word Jesus ever said.